Unless you follow the news in detail you might not know about current debates regarding the weed killer, glyphosate, widely used in garden products and in agriculture. Well, there is a lot going on – here is just a summary of the very large amount of material reported globally. Based on the amino acid, glycine, which is part of almost all proteins, its composition is usually referred to as N-(phosphonomethyl)glycine) or 2-[(phosphonomethyl)amino]acetic acid. One method of industrial preparation is to modify the naturally occurring amino acid, glycine1, which is one of the building blocks of biological proteins. Glyphosate blocks the production of other amino acids phenylalanine, tryptophan and tyrosine which means that it stops plants from making proteins. Thus growth stops and the plant dies. Effectiveness is, therefore, greatest when sprayed on leaves of actively growing plants. Commercial use as Roundup was started by Monsanto in 1974. Because of its effectiveness it now represents 53.5% total agricultural herbicide use in the USA 3. This effectiveness is partly due to the development of genetically-engineered crops which are resistant to it so it can be sprayed on the entire crop to kill weeds, even shortly before harvest. This means that there is an increased likelihood of glyphosate residues being present in harvested material. Around 93% of soybeans and 89% of corn and cotton crops in the USA are genetically engineered so that they are not sensitive to glyphosate3. 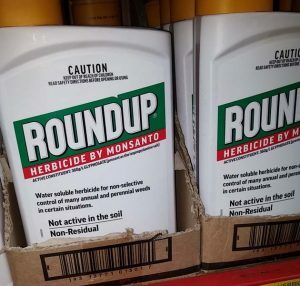 Since Monsanto’s patent for Roundup expired in 2000, it is now sold under a variety of brand names by both Monsanto and other agricultural/garden product manufacturers. 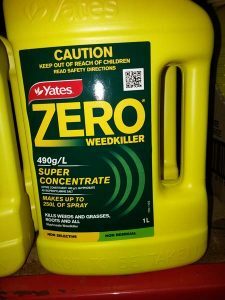 In Australia, products for agricultural use include Weedmaster Duo, Roundup, Zero as well as many more generic brands such as Glyphosate 450. The Australian Pesticides and Veterinary Medicines Authority (APVMA) currently lists 539 registered products which contain glyphosate4. Many have glyphosate in their names, others include Roundup, Zero and a variety of products with the manufacturer’s name followed by something like “weedkill concentrate”. Around 20 of those are available for garden use. We have been unable to find a reliable figure for the percentage of agricultural herbicide that involves glyphosate products in Australia. It is commonly used by local councils on public land5. There are stacks of material written about glyphosate with arguments for and against it. A large proportion comes from blogs, websites, the news media or government and manufacturers’ sources. We will refer to some of those here, but have tried to concentrate on material that has been reported or backed up in scientific literature which has been reviewed by scientific peers. That is not to say that blogs and news items are incorrect, but that, with so much debate, properly validated studies should be given priority. School of Public Health, Minnesota6. Although it was not possible to measure the percentage of sprayed glyphosate that ended up in the air, they estimated that 0.7% of application is removed from the air in rainfall. They detected glyphosate in 60 – 100% of their samples in Indiana, Iowa and Mississippi. This reflects observations by a number of researchers that a large range of pesticides, herbicides and fungicides are found in rain. For example, a study in 4 areas in the USA testing for 82 different chemicals showed their presence in rain at each of the 4 sites. Most were herbicides with metolachlor and atrazine being the most frequently found7. Glyphosate has also been detected in groundwater in a number of studies such as the most recent In Mexico where levels were 1.42 μg/L. It was also present in urine (0.47 μg/L) from local subsistence farmers8. An extensive report by Food Democracy Now and the Detox Network 5 in the USA quote results of measurements made by Anresco Laboratories showing levels as high as 1125.3 parts per billion (ppb) in Cheerios (an oat cereal) and between 200 – 400 in many other cereal products. The USA Food and Drug Administration has not tested levels in food. The big question is whether glyphosate harms us. Some studies suggest that it could. But clear conclusions are difficult to reach because of conflicting reports on what levels of exposure are acceptable and the difficulty of proving causation in humans. In a review of dozens of studies the International Agency for Research on Cancer (IARC) (an agency of the World Health Organisation (WHO)) concluded in 2015 that there was significant evidence that glyphosate was carcinogenic in rats and a probable carcinogen (for non-Hodgkin’s lymphoma) in humans. And the USA EPA Office of Research and Development came to the same conclusion. However, the European Food Safety Authority and the EPA Office of Pesticide Programs came to the opposite conclusions9, 10. Chronic kidney disease in farmers in Sri Lanka and El Salvador is suggested to be associated with a combination of glyphosate and hard drinking water11. However, causation has not yet been proven. Laboratory studies such as that on cell lines12 show that glyphosate can act as male hormone disruptor. Similar effects have also been found in frogs. When grown in the laboratory in the presence of glyphosate, common bacteria such as E.coli and Salmonella Resistance have shown resistance to antibiotics13. It is not clear if similar effects result in humans or other animals. Other concerns have been raised about increasing resistance of weeds to glyphosate. Just as over use of antibiotics to treat human disease is causing the development of resistant “super-bugs”, the prevalence of glyphosate use is causing resistant weeds to appear. In the USA 15 weeds species have developed resistance14. In Australia, 6 weed species are resistant to glyphosate15. This means reduction in crop yields or the use of herbicides which have known greater environmental or health impacts. Both community and academic researchers are calling for more research5, 16. Regulatory bodies in different countries have made different responses. In the USA many lawsuits were started by sufferers of non-Hodgkins lymphoma. In March, 2017, after the IARC and EPA Office of Research and Development decided that glyphosate was a probable carcinogen, a judge in California ruled that it should be listed as such in that state. However, Monsanto disputed the decision and discounted or disagreed with research like that described above, and sued claiming that the ruling was unconstitutional. Because evidence of risk of using glyphosate, action has been taken in many countries to restrict or ban its use. Unfortunately, there is confusion about action different countries have taken because of some misleading media reports. However, it seems the case that, the Netherlands has banned its use by individuals, Sri Lanka has banned all use and the major supermarket chains in Switzerland will no longer sell any product containing it17. In the European Union, discussion is still ongoing. After the WHO decision, at least 60 individuals and groups in the USA have filed lawsuits against Monsanto. Subsequently, there have been claims that the section of the EPA which had found glyphosate safe was colluding with Monsanto with a subsequent official enquiry18. The EPA has been preparing a risk assessment of glyphosate since 2015, but it has not yet been published. In Australia, the Australian Pesticides and Veterinary Medicines Authority (APVMA) reviewed the IARC/WHO report in September 2016 and concluded that glyphosate does not pose a cancer risk19. Should gardeners use it glyphosate products? Because of these debates and lack of consistent regulation, making this decision is a personal choice based on documented risks and your views on chemical use in general. SGA recommends that priority be given to using non-chemical methods i.e. planting ground covers, applying heavy mulch to minimize weed growth and, if necessary, removal by hand. 6. Chang F-C, Simcik MF, Capel PD. 2011. Occurrence and fate of the herbicide glyphosate and its degradate aminomethylphosphonic acid in the atmosphere. Environmental Toxicology and Chemistry 30, 548–555. 8. J Rendón-von Osten, R Dzul-Caamal. 2017. Glyphosate Residues in Groundwater, Drinking Water and Urine of Subsistence Farmers from Intensive Agriculture Localities: A Survey in Hopelchén, Campeche, Mexico. International Journal of Environmental Research and Public Health 14(6), 595; 9 CJ Portier, BK Armstrong, BC Baguley, et al. Differences in the carcinogenic evaluation of glyphosate between the International Agency for Research on Cancer (IARC) and the European Food Safety Authority (EFSA) Journal of Epidemiology and Human Health 70, 741-745. 9. Portier CJ, Armstrong BK, Baguley BC et al. Differences in the carcinogenic evaluation of glyphosate between the International Agency for Research on Cancer (IARC) and the European Food Safety Authority (EFSA). Journal of Epidemiology and Human Health 70, 741-745. 11. C Jayasumana, S Gunatilake, P Senanayake. 2014. Glyphosate, Hard Water and Nephrotoxic Metals: Are They the Culprits Behind the Epidemic of Chronic Kidney Disease of Unknown Etiology in Sri Lanka? International Journal Environmental Research and Public Health 2014, 11(2), 2125-2147. 12. Gasnier C, Dumont C, Benachour N, Clair E, Chagnon M-C, Séralin G-E. 2009. Glyphosate-based herbicides are toxic and endocrine disruptors in human cell lines. Toxicology 262 (3) 184-191. 13. Kurenbach B, Marjoshi D, Amábile-Cuevas CF, Ferguson GC, Godsoe W, Gibson P, Heinemann J. 2015. Sublethal Exposure to Commercial Formulations of the Herbicides Dicamba, 2,4-Dichlorophenoxyacetic Acid, and Glyphosate Cause Changes in Antibiotic Susceptibility in Escherichia coli and Salmonella enterica serovar Typhimurium. mBio 24th March. 14. Wechsler SJ, McFadden JR, Smith DG. 2017. What do Farmers’ Weed-Control Decisions Imply about Glyphosate Resistance? Evidence from Surveys of U.S. Corn Fields. Pest Management Science Accepted Author Manuscript. doi:10.1002/ps.4598. 16. Vandenberg LN, Blumberg B, Antoniou MN, et al 2017. Is it time to reassess current safety standards for glyphosate-based herbicides? Journal of Epidemiology and Community Health 71, 613-618.